Peas are legumes (see Fertilizer below) and are a cool season crop that may be planted as early in the spring as the soil becomes tillable. Pea seed will germinate well at soil temperatures as low as 50°F, but germination is slow. Extended periods of cool, wet weather during the germination period may cause rotting of the seed. For this reason, fertile, well-drained, sandy soils should be selected for early plantings. Finer-textured soils with high moisture-holding capacities are preferred for late spring crops. The use of treated seed is helpful in overcoming the problem of seed decay. 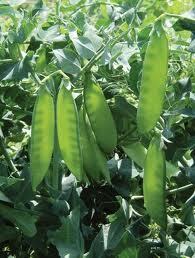 Peas that mature during hot, dry weather frequently show reduced yield and quality. If hot, dry conditions normally occur in your area, pea planting should be suspended in mid-May and resume in July for fall harvest. If hot, dry summer weather occurs for only short periods in your area, plantings can be made throughout the summer using heat resistant varieties for mid-summer harvest. English or Garden Pea—only the seed is eaten. Edible Podded or Snow Pea—only the pod is desirable.